Last night we were paid a visit from a cute little fairy I like to call Tinkle Bell. Tinkle Bell looks very similar to Tinker Bell, she’s petite, blond, and has the cutest little button nose. However, instead of sprinkling pixie dust she sprinkles her urine. All over our bed. Dear Tinkle Bell, I really appreciate you visiting at 1:30 in the morning, especially since I washed the sheets yesterday. You will be in my thoughts today as I do laundry all afternoon, again. ….and she still looks pleased with herself. 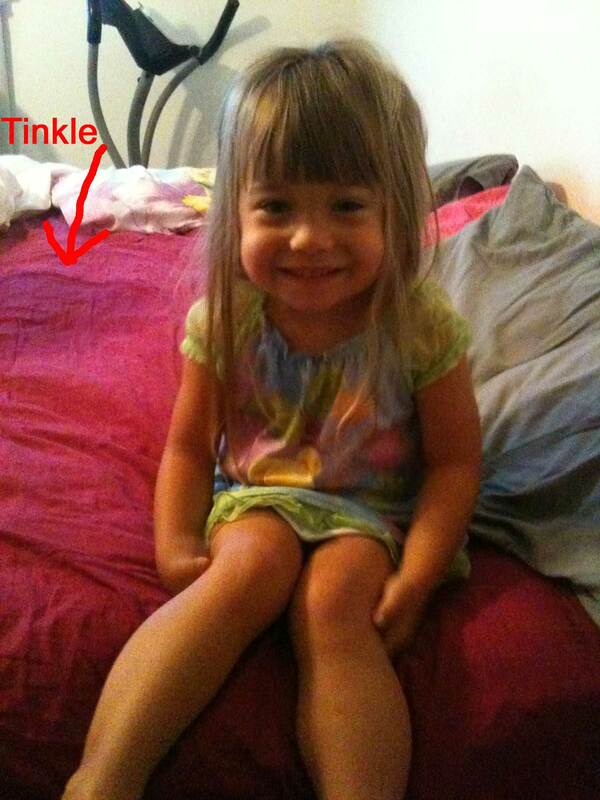 Tinkle Bell very funny. She was happy that she somehow managed not to pee on her nightgown. She moves so much when she sleeps that it was up around her chest, lol! Tinkle Bell! That is a riot!